The U.S. Z.O.R.T. 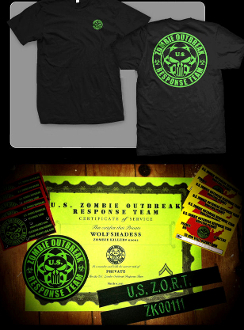 membership package includes a T-shirt, membership certificate, member ID card, 10 business cards, and 3 patches (our logo patch, the webbed U.S. Z.O.R.T. patch, and a patch with your very own Zombie Killer ID number!) Some items may be shipped separately.